Chisa Hutchinson’s intimate four character drama Surely Goodness and Mercy at Redtwist Theatre takes on the difficult subject of child abuse and makes children its heroes. During a month when we are seeing young people in the news rising up to speak out against violence it’s inspiring to see the story of a young boy who is able to escape the violence in his own home while doing good for others. The play, which is an NNPN rolling world premiere, is directed by Wardell Julius Clark who recently closed his hit production of Robert O’Hara’s epic comedy, Insurrection, at Stage Left. In contrast, Surely Goodness and Mercy is a quiet, more somber piece presented in Red Twist’s signature naturalistic style. The central question of the play is: how can we help one another? The play is about Tino (Donovan Session) a young boy who has recently lost his mother who sacrificed herself to save his life. He is thrust into a dangerous situation with his cruel aunt (Katrina D. RiChard) but befriends his school lunch lady, Ms. Bernadette (Renee Lockett), who watches over him. Bernadette is suffering the early symptoms of MS, a fact she is trying to hide from Tino. But being an observant and caring child, he notices. Tino doesn’t fit in at school and is getting bullied by kids for being bookish and sounding “weird” as his classmate Deja (Charlita Williams) puts it. 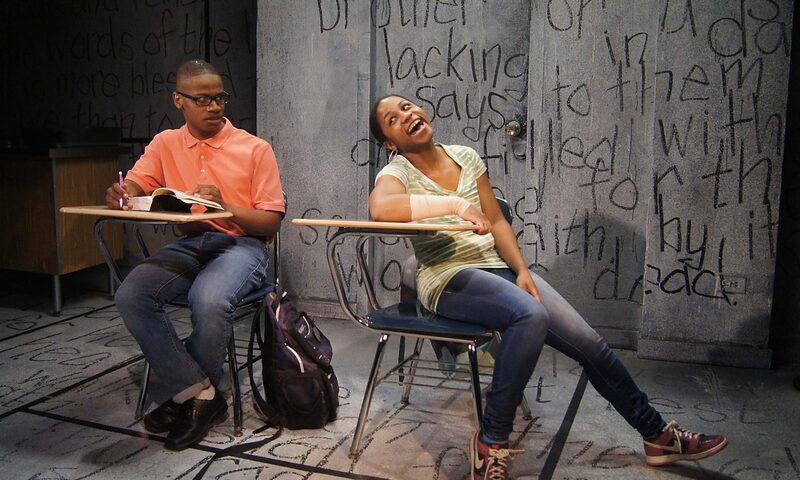 As the play progresses, Deja becomes Tino’s friend and ally. The play features several scenes where the two children are listening while the disembodied voices of unseen adults lecture them. This mirrors the power dynamic so often experienced by young people and gives us an opportunity to keep our eyes on the kids as they’re hearing the adults. When Tino dares to correct his English teacher over her grammar he finds himself on the wrong side of the school’s zero tolerance policy. Luckily for Tino, he has a Bible and he knows how to use it. For inspiration, for moral guidance and to reaffirm the common sense truth that helping others is our duty and our privilege. This play is refreshing because so often when we see stories about religion on stage it is a less than flattering critique. But in this play Tino, who charmingly chooses a church community due to it’s good reviews on Yelp!, stumbles into an inspiring Baptist sermon about helping your neighbor and immediately turns word into deed with a staggering act of love. To be reminded that children are capable of great things should put all of us adults to shame. Seeing a vulnerable child with everything to lose practice resilience without hardening or backing down is a fortifying message for anyone grappling with hopelessness. Watching Tino’s chosen community rally around two children on a mission is a powerful reminder of the potential for goodness within us all. Surely Goodness and Mercy runs Thursday-Sundays through March 18th at Red Twist Theatre 1044 W. Bryn Mawr. TRIGGER WARNING: This play contains graphic scenes of physical and psychological abuse. BIAS ALERT: I was recently in a writers group at The New Colony with Katrina D. RiChard.